"It is a very, very well-deserved prize," says JQI Fellow and CMTC Director Sankar Das Sarma. "This work led to an extremely exciting area and that excitement is still growing." The research behind the prize "illustrates, in a very nice way, the interplay between physics and mathematics," Thors Hans Hansson, a physicist at Stockholm Univsersity, said in an interview following the announcement ceremony. He explained the mathematics behind the prize during the ceremony using a cinnamon bun, a bagel and a pretzel. Topology is the branch of mathematics that offers a coarse distinction between those three baked goods, often capturing differences by counting the number of holes that different objects have. In topology, a bagel and a pretzel are fundamentally different because there is no way to add more holes to a bagel without tearing the dough and reshaping it. All materials are composed of the same basic stuff: atoms and their electrons. Atoms come in at least 118 different flavors, giving rise to enormous variation in material properties. For example, aluminum conducts electricity, but add some oxygen and you get insulating aluminum oxide. One is shiny, and the other is whitish and dull. Just like changing the kind of atoms in a material alters its properties, topological differences can lead to vastly different physical phenomena. The application of topology to physics was a revelation in the 1970s and 1980s, when many puzzling behaviors defied explanation. For example, experiments on thin materials subjected to low temperatures and enormous magnetic fields exhibited an odd behavior. Instead of their electrical current changing continuously as a magnetic field varied, it made discrete jumps. Now known as the quantum Hall effect, this behavior arose from the topological properties of electrons in the material. When confined to two dimensions and subjected to extreme conditions, the quantum behavior of electrons can get knotted up in topologically distinct ways. This realization explained where the jumps in current occurred and why they were stable even when samples were less than pristine. Haldane showed that quantum Hall physics could even be present without a large magnetic field, a concept that has been verified in both solid-state materials, such as topological insulators, and ultra-cold quantum gases. Numerous researchers at JQI, CMTC and CNAM take advantage of the interplay between topology and physics, using it to guide light in novel ways or study how to build a quantum computer. They've even extended some of the early work by Thouless to create a quantum pump. "The fascinating ideas of how topology can lead to weird phenomena is, by now, textbook material that has become the cornerstone of modern condensed matter research," says JQI Fellow and CMTC theorist Jay Deep Sau. "It is gratifying to see these foundational ideas being appreciated by the broader physics community through this prize." In the 1970s Kosterlitz and Thouless upended a long-held belief about the fragility of the flat, two-dimensional world. Physicists had proven that the effects of temperature were so destructive in two dimensions that there could be no stable phases of flat matter with a microscopic order. Unlike ordinary water, which can be a solid, liquid or gas depending on its temperature, flat materials did not exhibit transitions between ordered phases. In particular, physicists believed that superconductivity and ferromagnetism couldn’t exist in two-dimensional samples. But those results ignored an important consideration. "There are phase transitions possible in 2-D," Das Sarma says. "But you have to invoke topology." Kosterlitz and Thouless studied a theoretical model of interacting, spinning tops that are confined to live in a flat world. Because of their interactions, the tops close to each other tend to spin along the same axis. However, there can be small changes in the direction that each axis points. These changes can compound and create vortices—little tornadoes of tops whose axes twist around a region of their flat world. Topology assures that these vortices are stable, since there is no way to eliminate a vortex by adjusting a few tops. Or, as Hansson explained at the award announcement, "You can’t have half a tornado." What Kosterlitz and Thouless found is that these tiny tornadoes exhibit two extremes of behavior depending on the temperature of their flat world. At low temperatures, they get bound together into pairs of vortices spinning in opposite directions. But at higher temperatures, the pairs separate and wander around independently. At some intermediate temperature, the tops transition from one behavior to the other, and the average distance between vortices captures that change. "Here, topology appears in a different way than in the other work that the prize honors, on topological phases of matter," says JQI Fellow and CMTC theorist Victor Galistski. "The transition is between two topologically trivial phases, but the transition itself is described by a proliferation of these vortices." The discovery, which is now called the KT transition, applies to almost any two-dimensional material, from thin superconductors to films of superfluid helium. Researchers at JQI have even searched for it in collections of ultra-cold atoms trapped by crisscrossing laser beams. Symmetry provides a backdrop for this year's prize, since it has proved a powerful way for physicists to classify matter. For instance, the microscopic structure of diamond looks the same even after shifting your gaze to a new spot in the crystal. Symmetries that leave the microscopic structure unchanged predict many of the physical properties of crystals and serve as a way to group different crystals. Understanding how symmetries can change also allows physicists to understand phase transitions: Steam and liquid water have a rotational symmetry, but frozen ice does not. Often, symmetries offer protection against disruptions, since changes that do not break the symmetry cannot change any important properties. Physicists have known about symmetry protection for some time. Haldane’s work went beyond that of symmetry and was instrumental in providing an example of topological phases, which offer a similar kind of protection. He examined one-dimensional chains of quantum magnets and uncovered a surprising result. Quantum magnets possess a property called spin, which can be an integer or half-integer. In analogy to an array of bar magnets with north and south poles aligned along particular directions, each spin can have different orientations. When lined up in a chain, these configurations have different energies, and all possible configurations form an energy spectrum. To change from one quantum spin arrangement to another requires a magnetic field or some other disruption. Haldane showed that integer spin chains are protected by an unusual gap, or forbidden region, in the energy spectrum. The gap does not appear in the half-integer case, despite the fact that both types of spin chains have the same rotational and translational symmetry. This difference was unanticipated since earlier results on spin-1/2 chains were thought to hold for higher spins, too. The Haldane gap emerges above the lowest energy configuration, which has a topological character related to the collective behavior of the spins. The Haldane phase has symmetry protected topological order, as do topological insulators. These systems have received significant attention in the research community. Topology itself can offer protection to certain states, as is the case in the fractional quantum hall effect. Physicists are interested in exploring classes of protected states because a useful quantum device must be robust against outside disturbances that may interfere with device operations. "The prize celebrates the pioneering approach of using topology to predict and explain exotic behaviors in systems that locally may have the same symmetry as another, more trivial system,” Sau says. This line of research has opened the door to a wave of new materials with applications in quantum information science. 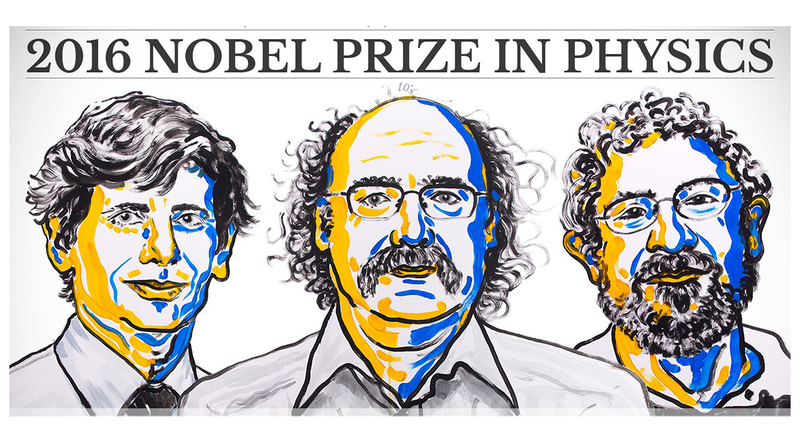 This page has been modified and updated to extend the descriptions of research that led to the 2016 Nobel Prize in Physics. Written by C. Cesare and E. Edwards with graphics by S. Kelley.